Laryngomalacia, shown in the image below, is a congenital abnormality of the laryngeal cartilage. It is a dynamic lesion resulting in collapse of the supraglottic structures during inspiration, leading to airway obstruction. It is thought to represent a delay of maturation of the supporting structures of the larynx. Laryngomalacia is the most common cause of congenital stridor and is the most common congenital lesion of the larynx. Laryngomalacia may affect the epiglottis, the arytenoid cartilages, or both. 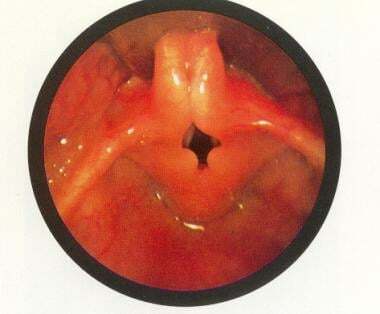 When the epiglottis is involved, it is often elongated, and the walls fold in on themselves. The epiglottis in cross section resembles an omega, and the lesion has been referred to as an omega-shaped epiglottis. If the arytenoid cartilages are involved, they appear enlarged. In either case, the cartilage is floppy and is noted to prolapse over the larynx during inspiration. This inspiratory obstruction causes an inspiratory noise, which may be high-pitched sounds frequently heard in other causes of stridor, coarse sounds resembling nasal congestion, and low-pitched stertorous noises. More severe compromise may be associated with a lower ratio of the aryepiglottic fold length to the glottic length. A classification system has been proposed. In type 1 laryngomalacia, the aryepiglottic folds are tightened or foreshortened. Type 2 is marked by redundant soft tissue in any area of the supraglottic region. Type 3 is associated with other disorders, such as neuromuscular disease and gastroesophageal reflux. Laryngomalacia is the most common cause of chronic inspiratory noise in infants, no matter which type of noise is heard. Infants with laryngomalacia have a higher incidence of gastroesophageal reflux, presumably a result of the more negative intrathoracic pressures necessary to overcome the inspiratory obstruction. Conversely, children with significant reflux may have pathologic changes similar to laryngomalacia, especially enlargement and swelling of the arytenoid cartilages. Some of the swelling of the arytenoid cartilages and of the epiglottis may be secondary to reflux. Occasional inflammatory changes are observed in the larynx, which is referred to as reflux laryngitis. When the epiglottis is involved, gravity makes the noise more prominent when the baby is supine. The exaggerated inspiratory effort increases blood return to the pulmonary vascular bed. This could account for the increased likelihood of pulmonary artery hypertension in infants with hypoxemia. Frequency is unknown. Often, the diagnosis is presumed. Rarely, the lesion may cause enough hypoxemia or hypoventilation to interfere with normal growth and development. In severe cases, when laryngomalacia may be associated with gastroesophageal reflux, feeding problems such as choking or gagging may occur. No known race predilection has been reported. Although this is a congenital lesion, airway sounds typically begin at age 4-6 weeks. Until that age, inspiratory flow rates may not be high enough to generate the sounds. Symptoms typically peak at age 6-8 months and remit by age 2 years. Late-onset laryngomalacia may be a distinct entity, which can present after age 2 years. Edmondson NE, Bent JP 3rd, Chan C. Laryngomalacia: the role of gender and ethnicity. Int J Pediatr Otorhinolaryngol. 2011 Dec. 75(12):1562-4. [Medline]. Dickson JM, Richter GT, Meinzen-Derr J, Rutter MJ, Thompson DM. Secondary airway lesions in infants with laryngomalacia. Ann Otol Rhinol Laryngol. 2009 Jan. 118(1):37-43. [Medline]. Cooper T, Benoit M, Erickson B, El-Hakim H. Primary Presentations of Laryngomalacia. JAMA Otolaryngol Head Neck Surg. 2014 May 8. [Medline]. Simons JP, Greenberg LL, Mehta DK, Fabio A, Maguire RC, Mandell DL. Laryngomalacia and swallowing function in children. Laryngoscope. 2016 Feb. 126 (2):478-84. [Medline]. Boggs W. Laryngomalacia Commonly Presents With Snoring or Swallowing Dysfunction. Reuters Health Information. Available at http://www.medscape.com/viewarticle/825146. May 15, 2014; Accessed: June 16, 2015. Powitzky R, Stoner J, Fisher T, Digoy GP. Changes in sleep apnea after supraglottoplasty in infants with laryngomalacia. Int J Pediatr Otorhinolaryngol. 2011 Oct. 75(10):1234-9. [Medline]. Faria J, Behar P. Medical and surgical management of congenital laryngomalacia: a case-control study. Otolaryngol Head Neck Surg. 2014 Nov. 151 (5):845-51. [Medline]. Unal E, Oran B, Baysal T, et al. Pulmonary arterial pressure in infants with laryngomalacia. Int J Pediatr Otorhinolaryngol. 2006 Dec. 70(12):2067-71. [Medline]. Richter GT, Rutter MJ, deAlarcon A, Orvidas LJ, Thompson DM. Late-onset laryngomalacia: a variant of disease. Arch Otolaryngol Head Neck Surg. 2008 Jan. 134(1):75-80. [Medline]. Revell SM, Clark WD. Late-onset laryngomalacia: a cause of pediatric obstructive sleep apnea. Int J Pediatr Otorhinolaryngol. 2011 Feb. 75(2):231-8. [Medline]. Chan DK, Truong MT, Koltai PJ. Supraglottoplasty for occult laryngomalacia to improve obstructive sleep apnea syndrome. Arch Otolaryngol Head Neck Surg. 2012 Jan. 138(1):50-4. [Medline]. Richter GT, Thompson DM. The surgical management of laryngomalacia. Otolaryngol Clin North Am. 2008 Oct. 41(5):837-64, vii. [Medline]. Whymark AD, Clement WA, Kubba H, Geddes NK. Laser epiglottopexy for laryngomalacia: 10 years' experience in the west of Scotland. Arch Otolaryngol Head Neck Surg. 2006 Sep. 132(9):978-82. [Medline]. Erickson B, Cooper T, El-Hakim H. Factors Associated With the Morphological Type of Laryngomalacia and Prognostic Value for Surgical Outcomes. JAMA Otolaryngol Head Neck Surg. 2014 Sep 4. [Medline]. Farhood Z, Ong AA, Nguyen SA, Gillespie MB, Discolo CM, White DR. Objective Outcomes of Supraglottoplasty for Children With Laryngomalacia and Obstructive Sleep Apnea: A Meta-analysis. JAMA Otolaryngol Head Neck Surg. 2016 Jul 1. 142 (7):665-71. [Medline]. [Guideline] Institute for Clinical Systems Improvement (ICSI). Preventive services for children and adolescents. 2008 Oct. [Full Text]. Bertrand P, Navarro H, Caussade S, et al. Airway anomalies in children with Down syndrome: endoscopic findings. Pediatr Pulmonol. 2003 Aug. 36(2):137-41. [Medline]. Cotton RT, Richardson MA. Congenital laryngeal anomalies. Otolaryngol Clin North Am. 1981 Feb. 14(1):203-18. [Medline]. Denoyelle F, Mondain M, Gresillon N, et al. Failures and complications of supraglottoplasty in children. Arch Otolaryngol Head Neck Surg. 2003 Oct. 129(10):1077-80; discussion 1080. [Medline]. Fauroux B, Pigeot J, Polkey MI, et al. Chronic stridor caused by laryngomalacia in children: work of breathing and effects of noninvasive ventilatory assistance. Am J Respir Crit Care Med. 2001 Nov 15. 164(10 Pt 1):1874-8. [Medline]. [Full Text]. Gessler EM, Simko EJ, Greinwald JH. Adult laryngomalacia: an uncommon clinical entity. Am J Otolaryngol. 2002 Nov-Dec. 23(6):386-9. [Medline]. Kay DJ, Goldsmith AJ. Laryngomalacia: a classification system and surgical treatment strategy. Ear Nose Throat J. 2006 May. 85(5):328-31, 336. [Medline]. Mancuso RF, Choi SS, Zalzal GH, Grundfast KM. Laryngomalacia. The search for the second lesion. Arch Otolaryngol Head Neck Surg. 1996 Mar. 122(3):302-6. [Medline]. Manning SC, Inglis AF, Mouzakes J, Carron J, Perkins JA. Laryngeal anatomic differences in pediatric patients with severe laryngomalacia. Arch Otolaryngol Head Neck Surg. 2005 Apr. 131(4):340-3. [Medline]. Midulla F, Guidi R, Tancredi G, et al. Microaspiration in infants with laryngomalacia. Laryngoscope. 2004 Sep. 114(9):1592-6. [Medline]. Sivan Y, Ben-Ari J, Soferman R, DeRowe A. Diagnosis of laryngomalacia by fiberoptic endoscopy: awake compared with anesthesia-aided technique. Chest. 2006 Nov. 130(5):1412-8. [Medline]. Smith JL, Sweeney DM, Smallman B, Mortelliti A. State-dependent laryngomalacia in sleeping children. Ann Otol Rhinol Laryngol. 2005 Feb. 114(2):111-4. [Medline]. Thompson DM. Abnormal sensorimotor integrative function of the larynx in congenital laryngomalacia: a new theory of etiology. Laryngoscope. 2007 Jun. 117(6 Pt 2 Suppl 114):1-33. [Medline]. Miller C, Parikh SR. Does supraglottoplasty improve outcomes in children with laryngomalacia?. Laryngoscope. 2018 Oct 17. [Medline]. Vandjelovic ND, Brown JR, Traboulsi HT, Thottam PJ. Impact of Infant Supraglottoplasty on Quality of Life. Otolaryngol Head Neck Surg. 2018 Sep. 159 (3):564-571. [Medline]. Ribeiro J, Júlio S, Dias C, Santos M, Spratley J. Supraglottoplasty in children with laryngomalacia: A review and parents' appraisal. Am J Otolaryngol. 2018 Sep - Oct. 39 (5):613-617. [Medline]. Kanotra SP, Vaitaitis V, Hopkins H, Fletcher M, Gonsoulin CK, Keith B. Impact of supraglottoplasty on parental preception of swallowing using a 10 question swallowing index. Int J Pediatr Otorhinolaryngol. 2018 Jun. 109:122-126. [Medline]. Carter J, Rahbar R, Brigger M, et al. International Pediatric ORL Group (IPOG) laryngomalacia consensus recommendations. Int J Pediatr Otorhinolaryngol. 2016 Jul. 86:256-61. [Medline].